Armed with 100A panel box, the mobile kitchen trailer power supply is at its premium and never will it let you down. 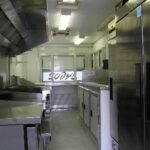 The mobile kitchen for rent has concession doors, serving windows and double fluorescent lights. Our engineers designed the kitchen trailers with a air conditioning system, roof vent, a light witch and 20-A dedicated outlets. In compliance with the requirements of health state department, our mobile kitchens for rent have three-compartment sinks that come with drain boards. A hand-washing sink is also available together with fresh water, waste water and hot water tanks. A propane tank with brackets is also provided. 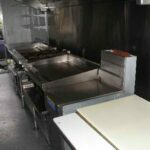 For food preparation needs, we have a deep fat fryer, flat top grills, burner oven, well steam tavles, stainless steel refrigerator and equipment tables. 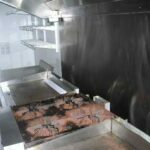 For your safety, the mobile kitchen trailer houses exhaust hood with splash guard, a wall-mounted fire extinguisher and security camera. 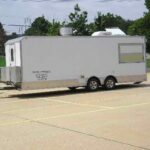 Mobile Kitchen Trailer Rental 24 ft.
For further assistance, please call (800) 205-6106 or visit our official website www.doukitchenware.com for all Mobile Kitchen Rentals inquiries and concerns. 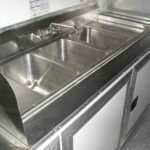 Dynamic Modular Kitchen Rental Deluxe Mobile Restroom Trailer Waste Tanks Dishwashing Unit Trailer 40 Ft. Dish Washing Trailer 20 Ft.